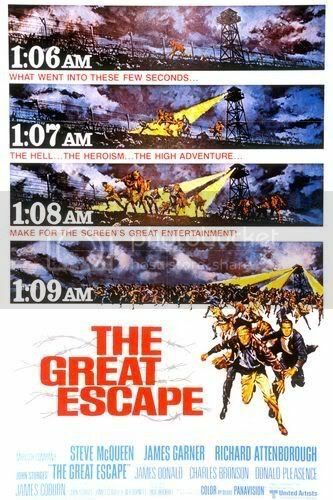 They don’t make a great deal of movies like this anymore. Truth is, they rarely did, even back in the day. Perhaps Ingmar Bergman was the last to tackle subjects like these, in ways like this. 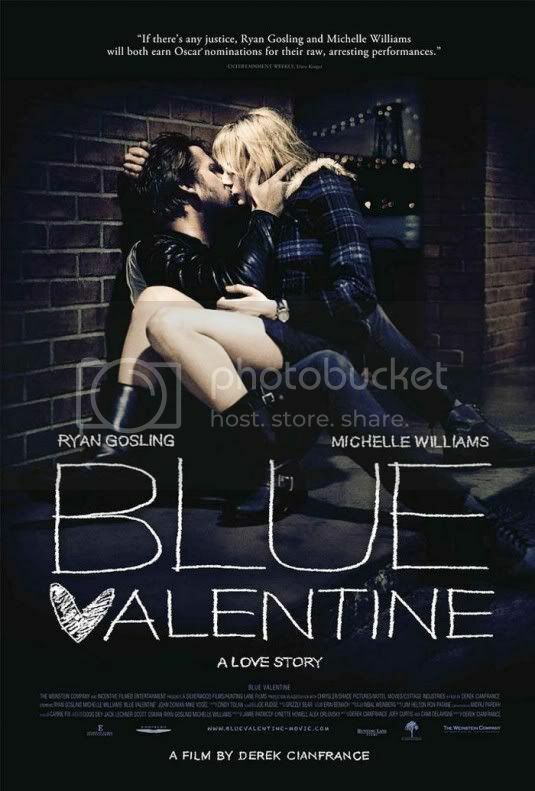 Blue Valentine details a marriage through the course of a couple days, with flashbacks to how it used to be. One storyline is decidedly more cheerful than the other. American culture is so intensely trained on how to fall in love, but there are few paragons in life or culture that teach how love changes and how couples can stay in love. Love at first sight is a popular element of many romantic comedies, and much literature. But what happens next? Why does it go so wrongly for so many couples? Blue Valentine does not answer these questions, and perhaps it shouldn’t. Instead it observes, quietly, the beauty and joy and love experienced as Dean (Ryan Gosling) and Cindy (Michelle Williams) first meet, and the bitterness, anger, and hardship they endure after six years of marriage. This entry was posted in 2010, 3.5 pirate flags, 4 stars, B, Movie Reviews, Pirate Flag Rating, Star Rating, Year on January 31, 2011 by Tim Irwin. 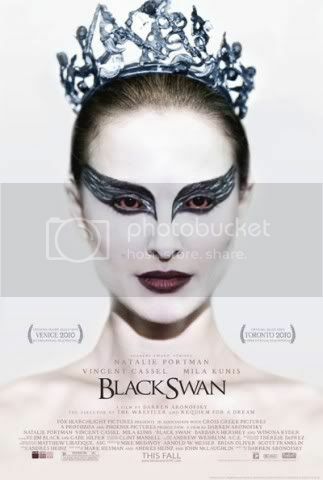 With Black Swan Darran Aronofsky again proves why he is one of the most interesting directors of this generation. His string of films is perhaps only rivaled by Christopher Nolan’s. From the low budget mathematics thriller Pi to the most powerful film of the past ten(ish) years, Requiem for a Dream [thoughts here], and through The Fountain [review here] and The Wrestler he’s proved he can handle intense dramatic material with a special flair of style and resonance. With Black Swan he turns his attention to a new sub-genre. Black Swan is a psychological drama horror/thriller. Think Mulholland Dr. meets All About Eve [review here], with a dash of Suspiria [review here] and Persona thrown in. It’s an intense portrait of obsession that would make Hitchcock proud, and is held together by an incredible performance from Natalie Portman. She stars as Nina, an aging ballet dancer in a reputable company in a large city. This entry was posted in 3.5 pirate flags, 4 stars, B, Movie Reviews, Pirate Flag Rating, Star Rating on December 10, 2010 by Tim Irwin. Note: I attended an early preview screening, and I am unsure whether the film was in its final, finished form. The print I saw ran just under two hours in length and was rated PG-13. Mark Zuckerberg is an antihero for the new generation of young adults. He is narcissistic, bitter, angry, and brilliant. He is brooding, lonesome, witty, and incredibly successful. Most of all, he understands “cool” as it pertains to the internet age, well before any of the suits could get their heads wrapped around the concept. 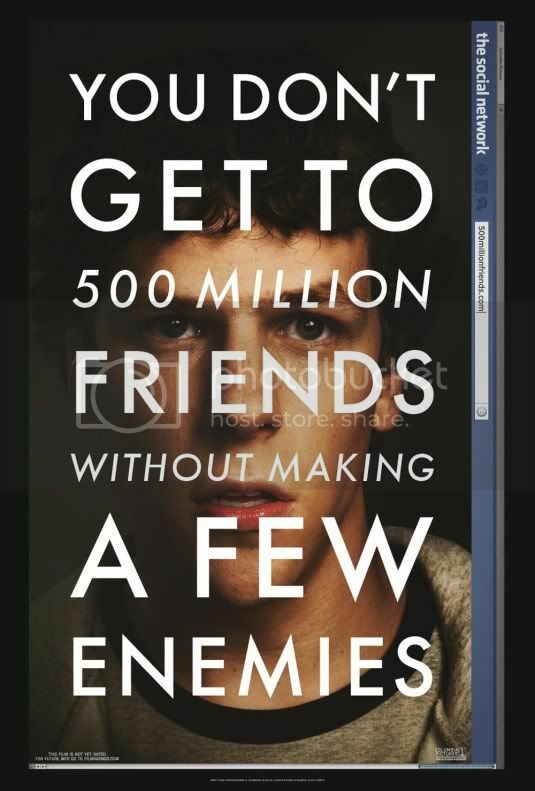 Jesse Eisenberg is Zuckerberg in The Social Network. He is nervous and fidgety, but supremely confident in his words and his methods. As the film opens he is a sophomore at Harvard. His opening date with Erica (Rooney Mara) is a disaster; he picks at her words and deals a number of backhanded compliments. Once he’s been rightfully dumped for being an insensitive cad, he returns to his dorm and blogs about Erica on LiveJournal. As he types and drinks he hits upon a new idea. He’ll create a website that allows users to choose one girl over another, rating their hotness. When the site is finished later that night Zuckerberg watches as traffic streams in and crashes the Harvard servers. This entry was posted in 3.5 pirate flags, 4 stars, Movie Reviews, Pirate Flag Rating, S, Star Rating on September 14, 2010 by Tim Irwin. 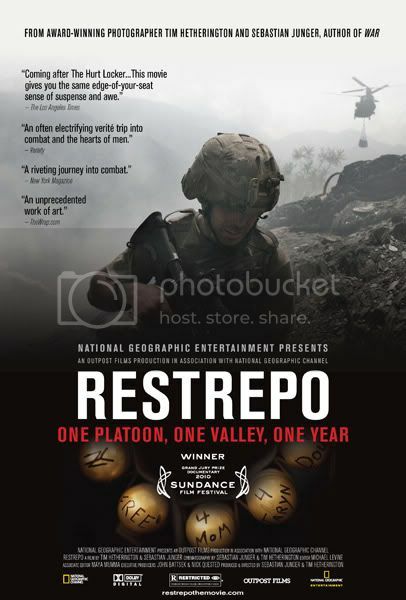 Restrepo is a challenging film, a documentary that presents some tough situations and the people who must live through them. It is difficult when the audience’s sympathy lies with the subjects and they act in ways that would be dishonorable under normal circumstances. But this is war, and whatever must be done to win is acceptable, no? Sebastian Junger (author of The Perfect Storm) managed to secure an embedded post, along with Tim Hetherington, in a US military platoon in one of the deadliest posts in the world: the Korengal valley in Afghanistan. During the time there the platoon lost some soldiers and killed many more militants. Captain Dan Kearney is the commander of the new forces, and is eager to erase past memories of American soldiers that the local civilians still harbor. Going in he refused to believe that the place was as bad as he was told. He was wrong. This entry was posted in 3 pirate flags, 4 stars, Movie Reviews, Pirate Flag Rating, R, Star Rating on September 6, 2010 by Tim Irwin. Few films in the history of cinema have laid as complete a groundwork for an entire subsequent genre as George Romero’s Night of the Living Dead. His reimagining of the undead creatures known as zombies created the rules for countless films, novels, comic books, and video games, in addition to a number of sequels. The Italians, in particular, reworked the formula in a variety of ways after the film’s sequel, Dawn of the Dead, made such a splash. Such an impact is rather strange for such a small movie, one with no budget and a lack of any greater intentions. Night of the Living Dead is a prime example of art being successful because of what audiences inferred rather than what the creators intended. 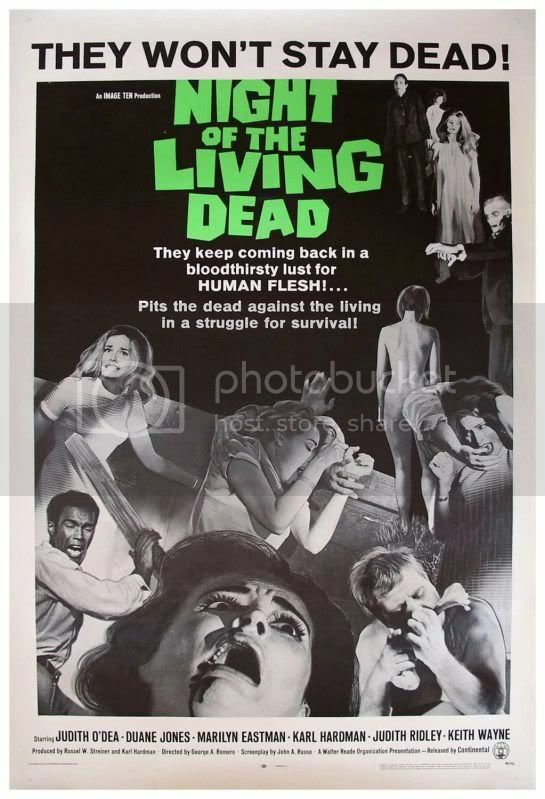 But, similar to how truly bad movies are enjoyable because the filmmakers believed they were good, Night of the Living Dead is effective because of how simple and unpretentious it is. This entry was posted in 4 pirate flags, 4 stars, Movie Reviews, N, Pirate Flag Rating, Star Rating on August 16, 2010 by Tim Irwin. Errol Morris is one of the most revered documentarians of all time, and he proves why in Mr. Death: The Rise and Fall of Fred A. Leuchter, Jr. In the past Morris has taken a mundane story (Vernon, Florida [review here] for instance) and made it fascinating. Or covered injustices or odd characters in films like The Thin Blue Line and Gates of Heaven. 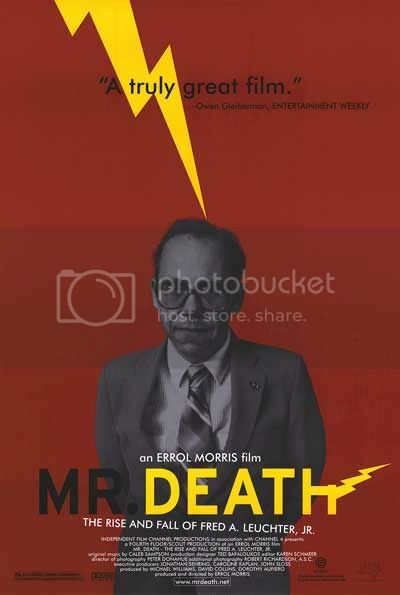 Mr. Death is slightly different, as he takes a polarizing character and presents him from a number of viewpoints. The way Morris can sway audiences’ sympathy through the simple revelation of information is incredible. If one is familiar with the story of Fred Leuchter, perhaps he or she might not be as affected by the film, but in Morris’ hands a newcomer will be twisted apart, torn to the core as the good guys and bad guys become fuzzier and more convoluted. This entry was posted in 3 pirate flags, 4 stars, M, Movie Reviews, Pirate Flag Rating, Star Rating on August 5, 2010 by Tim Irwin. It is quite remarkable how well All About Eve has withstood the pressures and passage of six decades. It is all the more incredible given that it was nominated for fourteen Oscars and won six. Neither before nor since has their been such a witty, biting attack on fame, stardom, and the theater. The fact that the Academy looked so highly on the film makes its themes even more ironic and delicious. The film is constructed of four strong central characters, and a bevy of supporting acts. First is Margo (Bette Davis), an aging actress. She is the queen of the stage, admired by everyone around her. 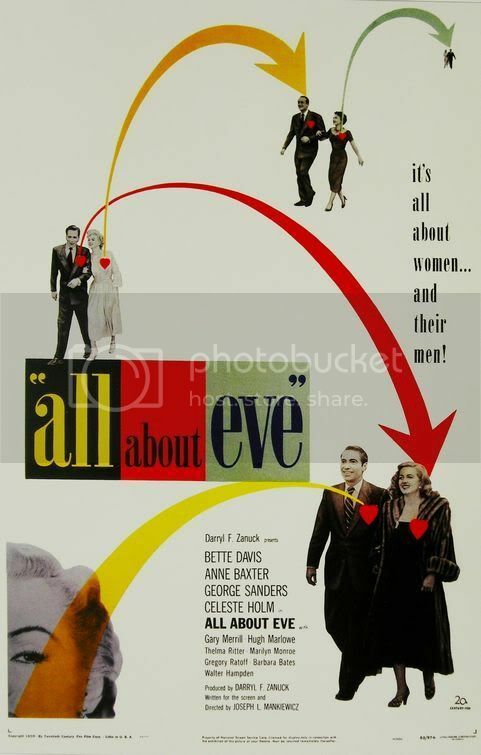 Her fears of soon becoming old and discarded are not assuaged by the sudden appearance of Eve (Anne Baxter), a young woman who idolizes and attempts to ape Margo’s every move and gesture. Eve is initially helped by Karen (Celeste Holm). Karen is a close friend of Margo, and her husband, Lloyd Richards (Hugh Marlowe) is Margo’s leading playwright. Lloyd’s role is slightly less substantial, leaving room for theater critic Addison DeWitt (George Sanders) to claim the fourth key role. This entry was posted in 3 pirate flags, 4 stars, A, Movie Reviews, Movies I Truly Love, Pirate Flag Rating, Star Rating on August 2, 2010 by Tim Irwin. In twenty, thirty, maybe fifty years only the filmographies of a few contemporary directors will be regarded as classics. I would venture to say that Christopher Nolan’s output between 2000 and 2010 will be counted among those. Rarely has a filmmaker been so consistent throughout six of his first seven films; rarely has one been able to examine similar themes through so many different lenses. Starting with Memento [review here], dipping to the relative low point of Insomnia, itself a remake, and then continuing with the two best Batman movies and a stellar drama about magicians, The Prestige [review here] (and this doesn’t even count the capable Following, made in the late 1990’s). 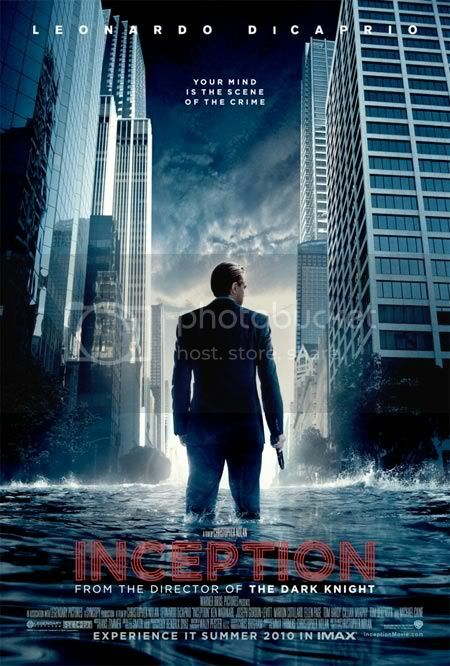 Inception is the culmination of those themes, told in a story Christopher and his brother Jonathan have been brooding over for many years. This entry was posted in 4 pirate flags, 4 stars, I, Movie Reviews, Pirate Flag Rating, Star Rating on July 15, 2010 by Tim Irwin. 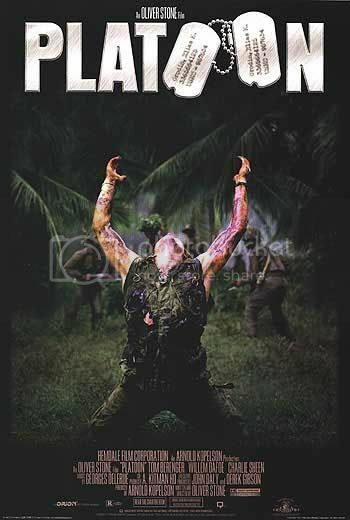 Platoon opens perfectly, with a quote from Ecclesiastes: “Rejoice, young man, in your youth.” The movie then launches straight into the story of a young man freshly arriving in Vietnam. It follows him through the first several months of his year-long tour of duty, through deadly ambushes and boring days at camp, and finally through a frantic and chaotic battle. There’s not a great deal of exposition in Platoon, merely Charlie Sheen’s narration as Chris, a lowly grunt in the infantry. He writes home to his grandmother, the only member of his affluent family who still talks to him after he enlisted. His reasoning is that it shouldn’t just be the poor and the unwanted that fight for society. There isn’t much of a greater context for the war, though Chris talks about it in an idealistic way. This, too, is soon swept away by the torrent of war that he faces continually. The challenge he faces of being the new guy, a man who is more expendable because he hasn’t put in as much time. The longer a man’s been serving, the more he should be put in cushy positions, in the opinion of many men, including half-crazed grunt Bunny (Kevin Dillon) and the vile Sergeant Barnes (Tom Berenger). On the other side is the “waterwalker” Sergeant Elias (Willem Dafoe). He has concern for the fresh meat, as well as for the innocent civilians the platoon encounters on their maneuvers. This entry was posted in 3.5 pirate flags, 4 stars, Movie Reviews, Movies I Truly Love, P, Pirate Flag Rating, Star Rating on June 8, 2010 by Tim Irwin.